The first half of the programm includes three works: ”Evocări II” (1980) by Paul Rogojină performed by cellist Mircea Marian, ”Fragment de Jurnal” by Laura Ana Mânzat performed by cellist Ella Bokor alongside her student Valentin Dimitrie Simion and pianist Iulian Ochescu and ”Trio” by Eric Ewazen performed by Ella Bokor, Iulian Ochescu and trumpet player Sergiu Cârstea. The second half of the programm includes works dedicated to Duo Cello Jaya such as ”Frumoasa și Bestia” (2015) by Aurelian Băcan performed in first audition. The piece has been recorded on the duo’s latest CD ”Tales of Duo Cello Jaya”. ”Swich on – Swich off” (2016) by Mariela Rodriguez is a piece also specifically composed for Duo Cello Jaya within the Isa16 Masterclass-Austria where by performing it Ella Bokor and Mircea Marian won the ”Isa16 Just Composed Prize”. 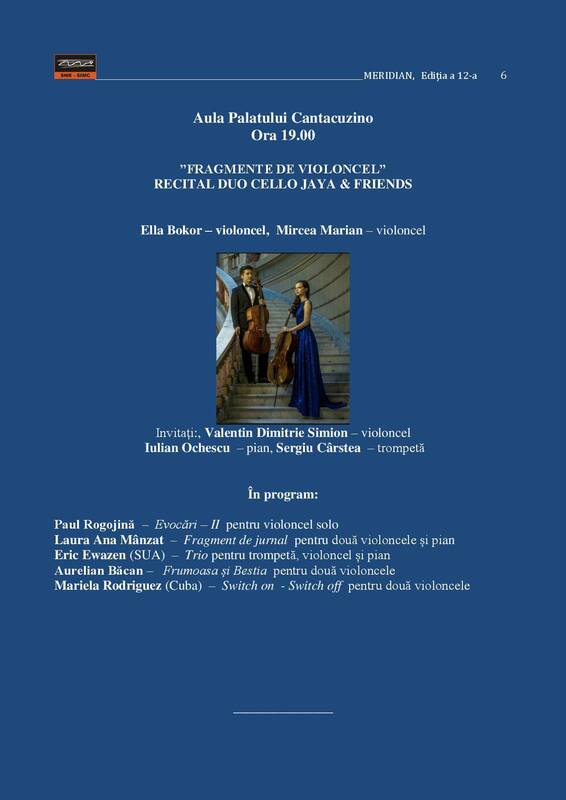 We are delighted to invite you to our concert. See you there!